Let’s assume, as is commonly argued within mainstream biblical scholarship, that there was a very small town of Nazareth in Galilee at the supposed time of Jesus’ birth and let’s assume that the reason Jesus was called “Jesus of Nazareth” was because he grew up in Nazareth, and that the birth narratives in Matthew and Luke are awkwardly contorted to have Jesus of Nazareth somehow also born in Bethlehem because all the Judeans of the day knew and expected that that’s where the Messiah was to be born. The concocted narratives of Jesus being born in Bethlehem are even pulled out as evidence for the very existence of Jesus since the evangelists were oh so embarrassed that he came from Nazareth in reality. 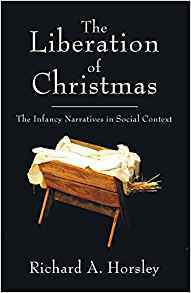 After reading some sections of Richard A. Horsley‘s The Liberation of Christmas: the Infancy Narratives in Social Context, I think we have some problems that seem so obvious in hindsight that I have to pinch myself for not noticing them before. Our attention will be primarily on Matthew’s birth narrative rather than Luke’s in this post. 21. K. Stendahl, “Quis et Unde? An Analysis of Mt 1-2,” in Judentum, Urchristentum, Kirche (Festschrift J. Jeremias; ed. W. Eltester; Berlin: Topelmann, 1964; reprinted in Interpretation of Matthew [ed. G. N. Stanton; Philadelphia: Fortress Press, 1983], 56-66), 97. Stendahl’s article is important and influential and is followed with further refinement by Brown (BM, chaps. 1 and 5). 22. Stendahl, “Quis et Unde?” 98; Brown, BM, 179-80. However, the claim that the geographical names, even as emphasized by the formula quotations, dominate Matthew 2 seems highly questionable. What dominates the narrative is clearly the conflict between the newborn king of the Jews and the reigning king, Herod. The threatened Herod figures directly or indirectly at every point in the narrative except the actual visit of the Magi in verses 9—11 and the naming in verse 23.23 Moreover, the notion that Matthew is pursuing an apologetic purpose is derived not from Matthew but only from the dispute in John 7. 23. As Stendahl himself points out, the text mentions “Herod’s name 9 times, and at all points of progress in the account” (“Quis et Unde?” 99). Yes, of course. The only reason we know there was supposed to be a problem with Jesus not really being born in Bethlehem are the narrative dialogue in one of the latest canonical gospels. We do not find supporting evidence in any earlier or independent records. From the lack of textual evidence, we are increasingly aware that at the time of Jesus there were almost certainly no standard or widely acknowledged “Jewish expectations about the Messiah” such as birth in Bethlehem, about which Matthew or other followers of Jesus of Nazareth would supposedly have been embarrassed.24 Just because the followers of Jesus early on applied to their “messiah” phrases from psalms that stemmed originally from the established Davidic royal theology (esp. Pss. 2 and 110) does not mean that they were defensively oriented toward some hypothetical established view of the proper pedigree of the messiah. Indeed, the royal Herodian and aristocratic priestly families that dominated Jewish Palestinian society would hardly have been entertaining messianic expectations, which could only have been threatening to their own position. Precisely that is the principal point of Matthew 2! The popularly acclaimed “kings” among the Jewish people who were active around the time of Jesus’ birth surely did not have Davidic pedigrees.25 There is little in the Gospel of Matthew itself or in the Palestinian Jewish milieu out of which the traditions he used emerged to suggest an apologetic motive. The typical early Christian concern to interpret Jesus according to fulfillment of biblical promise and prophecy (and prototype) would appear to be the operative motive in Matthew’s use of the formula quotations to embellish the significance of the events narrated in chapter 2. 25. For a sketch of these popular Jewish kings and their movements, see R. A. Horsley and J. S. Hanson, Bandits, Prophets, and Messiahs (Minneapolis: Winston- Seabury, 1985), chap. 3.